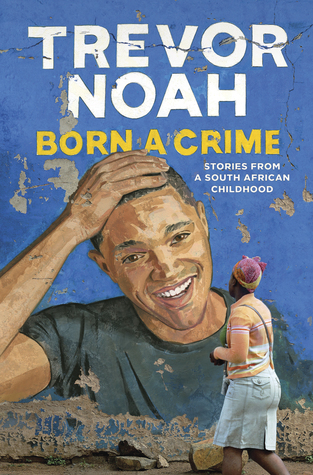 Welcome to our first discussion of Trevor Noah's memoir, Born a Crime. This discussion covers chapters 1-3. It's a short segment, only about an hour's worth of reading, so if you're just joining us now you have plenty of time to catch up for our next discussion next Monday! Here are a few questions to get the discussion started. Feel free to respond to any or all of them, or pose your own discussion points here in the comments, on Facebook, Twitter, or your own blog. If you do write a blog post for this week's discussion, be sure to post a link back so we don't miss it! Easy peasy question: are you enjoying the book so far? What do you think of Noah's writing style? What did you know about South Africa and apartheid before going into this book? Is there anything that's surprised you so far or that you've learned? How have you responded to each chapter? Do you have any favorite quotes from the book you'd like to share? What's your initial impression of Noah's mother? What about Noah himself? Noah says that everything that's gone wrong in his life has been because of a secondhand car. Have you ever felt like that about anything? We hope you're enjoying Born a Crime so far, and look forward to seeing what you think of it! Be sure to stop by next Monday for our discussion of the second half of Part I. Thanks for your awesome questions and for organizing this read-along. Otherwise, who knows how long the book would have been on my TBR?! I wasn't sure at all what to expect from this book, especially since I rarely (never) read memoirs or biographies, but I love Noah's writing style. He's one of those people who writes exactly the way he talks, and I could totally hear his voice in my head as I was reading. He's also an awesome storyteller — the sneaky pooping incident had me in stitches. I have to admit that I have not completely finished the assigned reading for this week yet, but I will get there! But, honestly, I went into this book knowing next to nothing, both about the author and the apartheid. However, when a book starts out with this paragraph, I know that it's going to something that is going to make me think and possibly even challenge me . . .
"The genius of apartheid was convincing people who were the overwhelming majority to turn on each other. Apart hate, is what it was. You separate people into groups and make them hate one another so you can run them all."